The two nations had a bit of previous from past encounters, with Thierry Henry's infamous handball effectively denying the Irish qualification for the 2010 FIFA World Cup. Coming off the back of a stunning win over Italy in their last group encounter, Martin O'Neill's men were up against one of the favourites to win the entire tournament, and France had enjoyed a longer recovery time to prepare for this knockout clash. It would seem then, with the odds stacked firmly against them, the luck of the Irish would need to play a big part to see the underdogs into the last eight. There was nothing lucky about the start of the match though, as Ireland's Shane Long duped Paul Pogba into making a rash challenge inside the penalty area after a quick attack from the kick off. Robbie Brady - hero against Italy - stepped up to sweep his penalty in off the base of the post having sent Lloris the wrong way. Pogba started to affect the game in a positive manner soon after, with a strong bursting run down the left flank culminating in a run that would pick out Griezmann in the middle for a header that missed the target. Griezmann then turned provider as he whipped in a delicious ball for Giroud, but Shane Duffy did remarkably well to head the ball away before the Arsenal man could have a sniff. Ireland were not content with just retreating and inviting a French onslaught though, and after a smart period of swift interplay Daryl Murphy shot fiercely at goal as Lloris made a one-handed stop. A scintillating start continued, with a high tempo and chances being carved out of every bit of possession. Paul Pogba forced Darren Randolph into making an acrobatic save from his knuckled free kick, before Duffy narrowly headed wide from a free-kick at the other game. 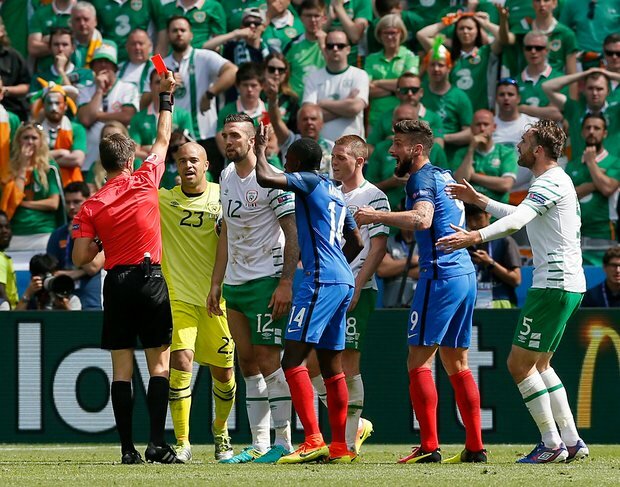 There was even time for a skirmish before the break, as Dimitri Payet and Griezmann had shots blocked by brave Irish defensive work. The second half had a high standard to match. The hosts continued to force the ball into the danger zone, but couldn't quite find the killer finish to tie the game. Laurent Koscielny reacted well to a deflected cross but his diving header spun wide. 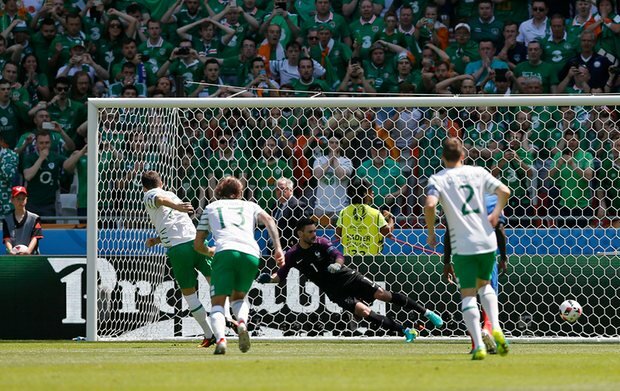 Ireland broke at breathtaking speed, as James McClean's whipped cross just fell short of Shane Long. The contest began to mirror a basketball match, with end-to-end attacks from both teams failing to find the net. In the 58th minute, Bacary Sagna found space on the right hand side to pick out a pinpoint cross for Griezmann unmarked in the middle. The Atletico star produced an impressive leap and header to flash the ball past Randolph and put Ireland on the ropes. The probing and pressing had brought Les Bleus back into the game, but Ireland still carried a threat on the counter with the energy of McClean and Long. 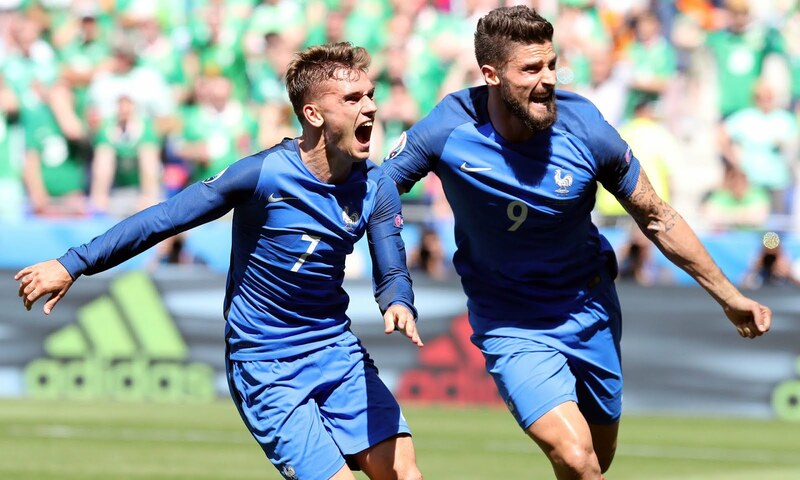 Ireland failed to keep their composure and caved in to another French attack just three minutes later, with poor organisation allowing Olivier Giroud to knock on a header for Griezmann, who drilled the ball into the bottom corner with an instinctive finish. France had shown great heart and desire to fight back from the early setback, and now were completely dominating the game. Things turned from bad to worse for the Irish, as Griezmann scampered away set to round off a quick-fire hattrick, only for Duffy to trip the striker on the edge of the box. Referee duly dismissed the centre-half for denying a clear goalscoring opportunity, capping off a disastrous eight minutes for the men in green. Giroud made way for Andre-Pierre Gignac, who had an instant impact as France threatened to run rampant. A wonderful curling effort rattled the bar as the forward struck from 25 yards, fine margins kept Ireland alive in the dying embers of the game. A cacaphony of noise from the famous Irish support wasn't enough to spur a comeback, as France saw the game out with relative ease and enjoyed all of the advantages of the extra man - bullying Ireland out of the tournament. There will be concerns about N'golo Kante though, with the Leicester midfielder picking up a booking that rules him out of the quarter final clash with either Iceland or England. Didier Deschamps will have many decisions to make in the coming days as his players edge closer to fulfilling a national dream.